Skywatchers are already gearing up for a spectacular show from the annual Geminids meteor shower this week, and now astronomers say a new meteor shower's debut could make for even more shooting stars. NASA officials say a never-before-seen show could come from comet Wirtanen, which is in the Jupiter family of comets (so-called because their orbits are altered by their close passage to the gas giant Jupiter). First discovered in 1948, comet Wirtanen circles the sun about every 5.4 years. Though it has skimmed Earth's orbit many times, 2012 could mark our planet's first encounter with the dirty snowball's debris streams. 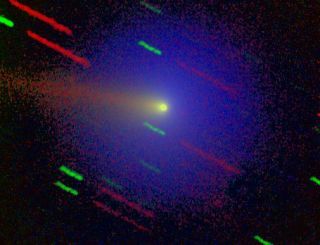 "Dust from this comet hitting Earth's atmosphere could produce as many as 30 meteors per hour," Bill Cooke of NASA's Meteoroid Environment Office said in a statement Tuesday (Dec. 11). Cooke said stargazers will have the best shot of seeing both the Geminids and the new shower on the night of Thursday, Dec. 13. The moon will be at new phase then, meaning the sky will be dark and moonless, making for perfect viewing conditions. Looking south after sunset in mid-December. Meteors from the new shower, if any, would emerge from a radiant in the constellation Pisces. "Meteors from the new shower (if any) will be visible in the early evening, with the Geminids making their appearance later on and lasting until dawn," Cooke added. If the new shower materializes, astronomers say they might call it the Piscids, since scientists' models put its radiant (the point on the sky where the meteors appear to originate) in the constellation Pisces. Cooke said the new shower is also predicted to be slow-moving, which should help distinguish its meteors from the quicker Geminids.